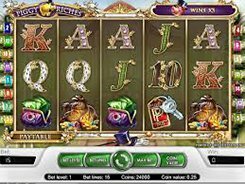 Piggy Riches is a humorous money-themed slot with colorful pig characters and money related articles. On the reels you will see richly adorned playing card icons from 10 to Ace, a piggy bank, a big wallet stuffed with money, a golden bank card, etc. 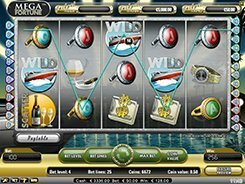 There are three adjustable betting options in the game: a coin value ($0.01 to $0.5), the number of coins (1 to 10), and the number of active lines (1 to 15), so you can place a bet anywhere from a penny to $75 per spin. 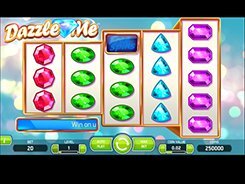 The slot is equipped with a standard set of a wild, a scatter and free spins. A wild (Rich Piggy) substitutes for other symbols and triples your wins when substituting. A scatter symbol (Glamorous Piggy Lady) unlocks the round of free spins if 3+ appear on the reels. 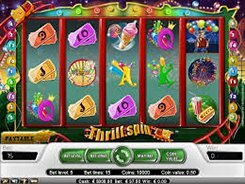 At the beginning of the feature you are to customize the volatility of your free spins by selecting the number of free spins and an associated multiplier you want (the higher the number of free spins, the lower a multiplier, and vice versa). Besides, 5 scatters pay out the second-largest jackpot worth $7500. The highest prize in the game is $10,000.